Dashain, the biggest festival of Hindus in Nepal, is the time of the year when people dig in delicacies and engage in merrymaking. This is the time of the year when academic institutions and almost all offices remain closed for at least a week, giving people ample of time to socialise with relatives and friends, and engage in fun-filled activities. One such fun-filled activity, around a decade back, used to be climbing onto rooftops and flying kites. In those days, the skies of the Kathmandu Valley used to be dotted with kites of different colours, with people engaging in “kite fights”, a practice of bringing down the kite of others by using strings coated with glass particles, aloe vera and cooked rice. But as the penetration of smartphones and internet is increasing in the country, kite-flying is becoming a thing of the past. No wonder, skies look empty these days even during the peak kite-flying season. “People are more engrossed with technology and social media these days,” said Anil Shrestha, owner of Annapurna Kite Centre, a kite store located at Ason. “This has caused demand for kites to plummet.” With the fall in demand for kites, one of the age-old Nepali traditions is also on the verge of extinction. Kites ranging from Rs3 to Rs350 are currently available in the domestic market. Likewise, threads coated with glass particles, aloe vera and cooked rice, are available for Rs250 to Rs1200 per 1,000 metre. Spools (lattai), on the other hand, cost Rs100 to Rs3,000. But sales of these goods have remained very low. Kite sales have dropped by 40 to 50 percent this year, according to Dinoj Chitrakar, owner of Shree Chitrakar Store and Kite Centre, one of the oldest kite shops in Ason. “Last year, during Phulpati [the seventh day of Dashain festival], my shop was filled with people. But this year the flow of people is negligible,” Chitrakar said, without explaining the number of kites he sold this year. Until last year, Chitrakar was selling around 5,000 to 10,000 spools during Dashain. 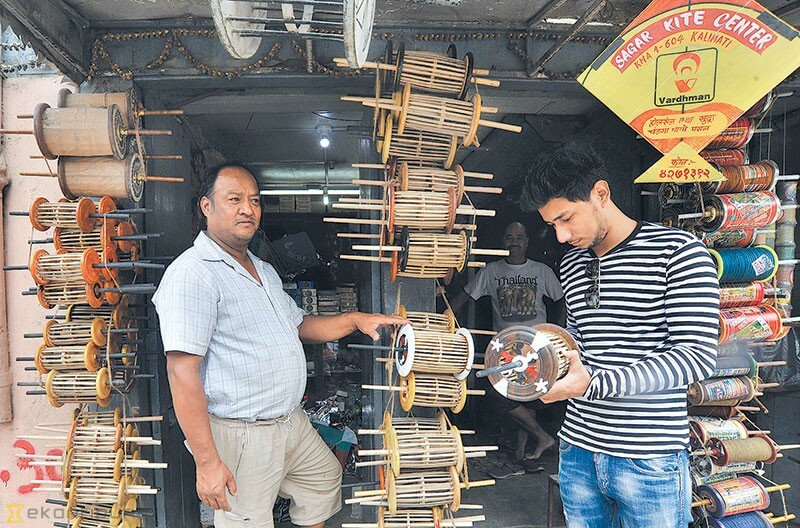 “This year, very few of these spools have been sold,” Chitrakar said.Earlier, demand for kites, stings and spools used to go up before the Dashain festival formally began. “This year we had to wait till Ghatasthapana [the first day of Dashain, which fell on Thursday] to see the first client step into our shop,” said Pratap Man Shrestha, a kite seller based in Maru, who conducts business only during Dashain.